I’m on Stay-cation #3. Yup, when you sell your soul time to a decent company, stay there long enough, and work every holiday, they woo you with perks like paid vacation time and insurance. Yay!!! I’ve got “old blue” back from my father-in-law and as a side-note, the gas gage works for the first time since I’ve owned the beast. Thank you! Thank you! I’ve been working on back-to-back vampire Beta reads. I should be finished with the latest one in the next day or two. Different authors, different countries, fun stuff!!! I like doing these. It makes me think and use my brain in a different way. I don’t feel qualified to Beta read other genres, but I have read every vampire story I can get my hands on. Though that might make me sound like I’m a weirdo, I’m really not. I learn something new each time. I’ve met some amazing people in the writing community who have helped me so much. It’s nice to be able to give something back in return. While it seems as though all of my writing buddies have been very hard at work, finishing and publishing their novels; my youngest character will be a retired grandmother before I’m completed! Poor Chloe! I’m so sorry your author keeps abandoning you. All of my characters probably needed therapy anyways. I’m feeling “stuck” at the moment. I don’t know what my problem is. I’m not all that concerned. I’ve got lots of other projects to play with. There’s nothing like procrastination to get the creative juices flowing. I have never had ANYTHING come easy for me. I think I secretly feel that I MUST put in my dues and have stuff go horribly wrong in order for the universe to take me seriously. I know I’m not the only masochistic writer out there, so that gives me a little comfort. I don’t feel qualified to slop my ramblings on a page and expect people to read and enjoy my dribbles unless I’ve done lots of grunt work, then have something of epic proportions go wrong. It must be part of my “process.” After all, if writing a book were that easy, everyone would do it! 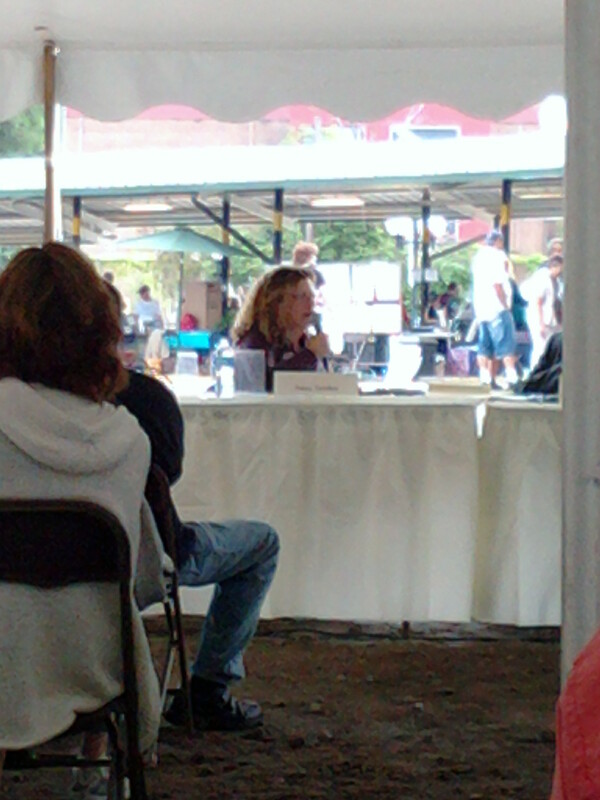 Author Jaimy Gordon at the main tent, 2011 Kerrytown Bookfest, Ann Arbor, Michigan. I went to the 2011 Kerrytown Bookfest on Sunday. I had soooo much fun! I already posted these pictures up on my Facebook page, but I didn’t get to throw in my thoughts and impressions. For those of you who are not familiar with the area, Ann Arbor is a really fun college town in Michigan. It’s one of those places where art and life go hand-in-hand. People come from all over the world to attend The University of Michigan, and end up staying in Ann Arbor. It’s the kind of place where you can enjoy Ethiopian food, drink a micro brewed beer, and eat vegan ice cream. It’s a melting pot of converging cultures and ideas. There are museums, and theaters, and old movie houses that still show black and white films on occasion. There’s a coffee shop on every corner, and at least as many bookstores. If you’re looking for vintage anything, it’s here. If you want the latest gadget or electronics, it’s here. Ann Arbor is one of those towns where you can plop a modern sky rise next to a rambling Victorian mansion that’s been converted into an apartment complex, and both buildings make sense and feel right at home sitting next to each other. If the people and city of Ann Arbor are unique and creative, then this is especially true in Kerrytown. 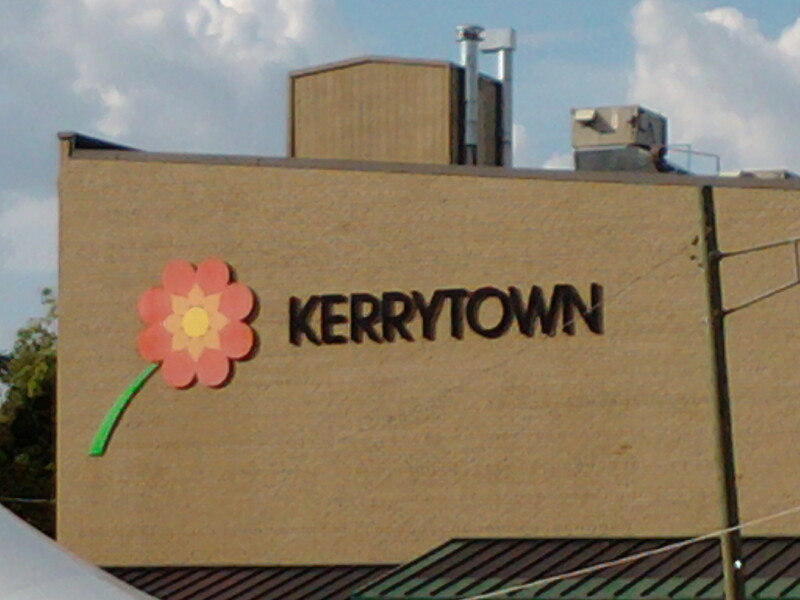 Kerrytown is like its own separate village within Ann Arbor. It is the creative nucleus of the city. Kerrytown has shops, within shops, within shops. They still have brick streets. They have a Farmer’s Market that goes on all year, even in winter. People in Kerrytown wear what they want, say what they want, and do what they want. They quote poetry and enjoy vinyl records. They wear Birkenstock shoes with handmade socks knitted from organically grown cotton. They love to decorate and put personal touches on everything. They can take the tiniest strip of soil, and turn it into a beautiful garden. I’ll put up a post in the next day or two of mundane objects that the residents have turned into usable artwork. 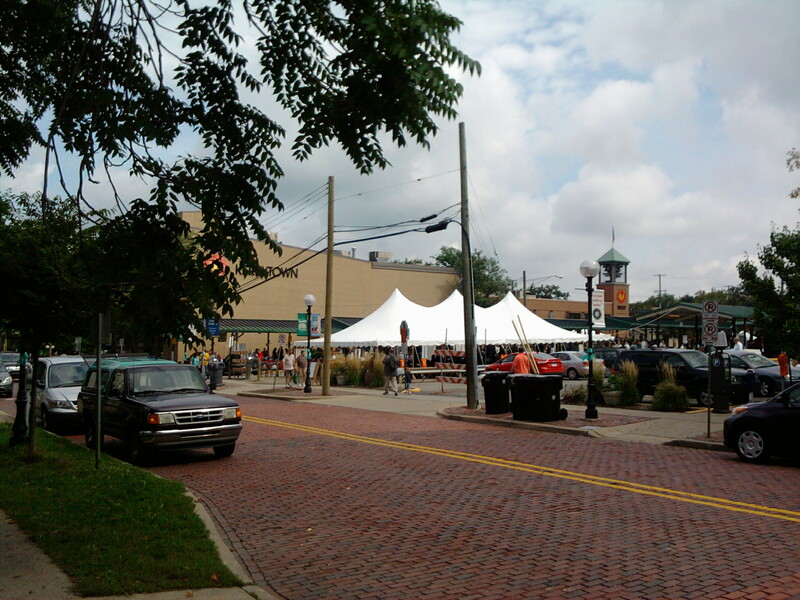 Kerrytown is one of my favorite places in all of Michigan. Author Louise Penny in the main tent at the 2011 Kerrrytown Bookfest, Ann Arbor, Michigan. 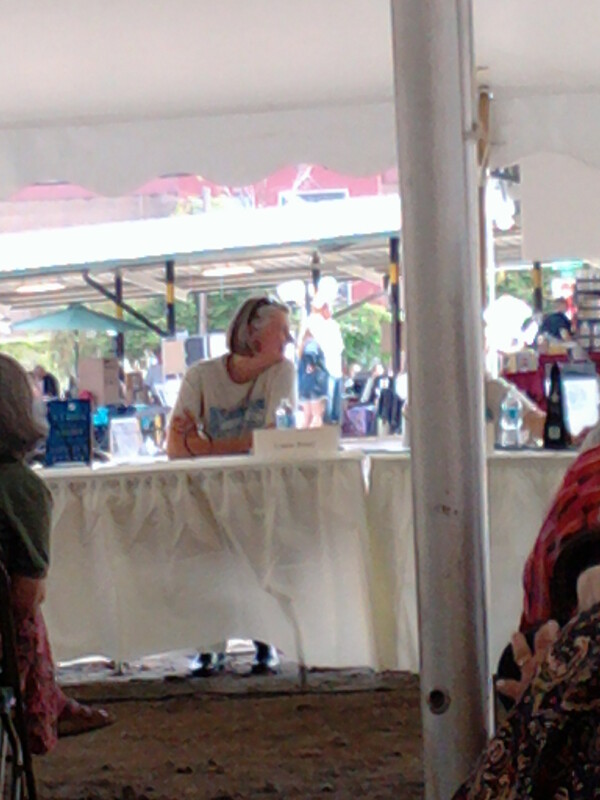 I have to say, Louise Penny was my favorite author of the day. She’s incredibly down to earth and charismatic. Because everyone wants to take her picture, she likes to take pictures of her audience, and put them up on her author’s blog. I think that’s AWSOME! She is very passionate about her characters. She loves what she does. She told lots of antic dotes about her own life, and gave great advice to other writers. She was fun to listen to. 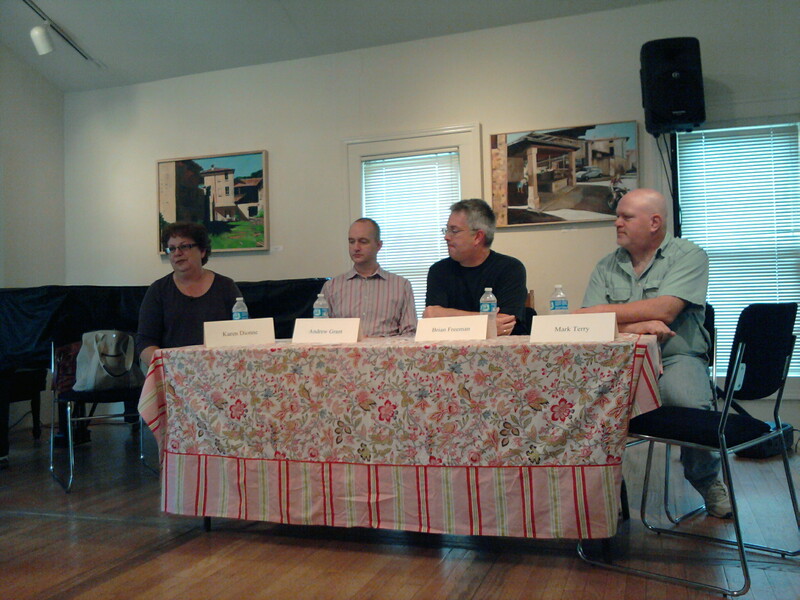 Authors (from left to right) Karen Dionne, Andrew Grant, Brian Freeman, and Mark Terry at the Kerrytown Concert House, 2011 Kerrytown Bookfest, Ann Arbor, Michigan. I’ll have to start following Mark Terry’s blog. He’s been writing a thriller novel and posting his story online. He says that his posts are “same day,” and not scheduled. That made me VERY curious. 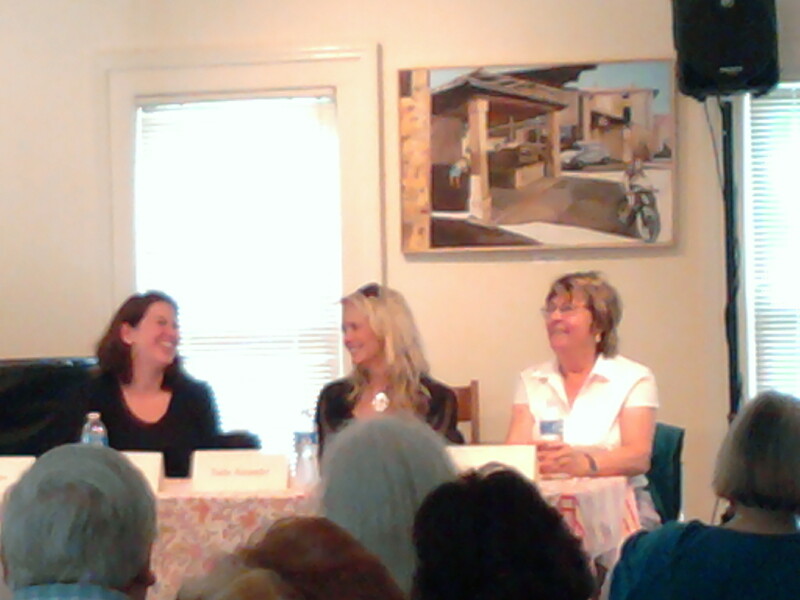 Authors (from left to right) Stefanie Pintoff, Tasha Alexander, and Maureen Jennings at the Kerrytown Concert House, 2011 Kerrytown Bookfest, Ann Arbor, Michigan. Previous postFeeling nostalgic…the kiddo’s back in school. Next postA LONG Rant. Be Warned! Everyone Needs to Play Nicely Together! The pictures are not the greatest, but it was lots of fun!